The 8 zones control panel can be used alone or in the RS485 bus-line alarm system. It is used for independent users in the community or building security system. 8 zones control panel has 8 wired zones and 8 wireless zones, 1 siren output. Support 1 installation code, 1 main code, 4 user codes. 8 zones control panel also supports wireless function, user can use the wireless remote controller to disarm the control panel. Working current: 40 mA (standby), the current of alarm is related to the external siren. Zone: 8 normally open or normally closed zones, programmable for shielding, immediate, access, internal, 24 hours, emergency, etc. Shield Zone: When the wired and wireless zones are not in use, it can be programmed to turn off the zone or connect the loop resistor. Immediate zone: After arming, the immediate zone is triggered, it will alarm immediately, applied to the perimeter zone. Access zone: Provides exit and enter delay time, which is convenient for users to arm and disarm control panel and is applied to door contact. Internal zone: used for interior areas such as living room, bedroom, etc., providing exit delay and entry delay time following entry and exit zone. 24-hour zone: It is always active, regardless of whether it is disarmed or not, it will alarm as soon as it is triggered. Emergency zone: Once triggered under normal working conditions, the alarm sounds immediately on the scene and is applied to the panic button. Key: If the zone triggers the arming and disarming of the control panel, the key switch type is set by item 16 in the programming table. Doorbell: In the disarmed state, the zone triggers, and the keyboard sounds two prompts (1 long and 1 short). In the armed state, it is the same as the immediate zone. 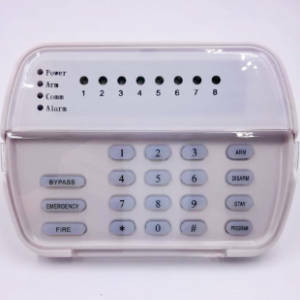 Please contact us freely to get quotation or information about the burglar alarms you want.